Optimize and Restore Performance of youe SSD in Windows XP, Vista,7 and 8. The SSD Tweaker has a massive distribution around the world for its simple yet powerful features and interface. It has been reviewed and reccommended by many PC mangazines and Tech Websites. Try the SSD Tweaker today and get the most from your powerful SSD. RepRemote brings you the first app for iOS to give you full control of your 3D printer. Play Age of Empires II - Conquerors in Windows 7 & Vista. This Age of Empires II: The Conquerors Expansion Launcher fixes problems with incorrect colors durning game play when you are using Windows Vista, 7 and 8. These colours can affect game play and can be just a little bit annoying. No setup is required. Simply run the Launcher and it will scan its local folder then the entire hard drive until it has found your game installation. Then you are ready to play. 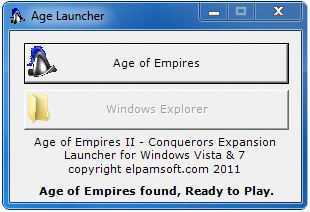 The Age of Empires Launcher is Freeware.